KATHMANDU, Feb 17: The Election Commission (EC) has finally dropped its plan to purchase electronic voting machines from UK-based electronics supply firm Smartmatic, following a series of controversies sparked by its plan. "There is now no possibility of procuring EVMs from Smartmatic or any other company and using them for the upcoming May-June elections," said Chief Election Commissioner Ayodhee Prasad Yadav. Asked about his change of mind, CEC Yadav said the media had unnecessarily dragged him into controversy. "Media unnecessarily tarnished my image over the EVM procurement. I alone cannot stand for the machines if the state does not required them," he said while also announcing not to procure voting machines from any company. Insiders say the election chief had given up hope and reached his decision to abandon the idea of procuring the machines after three new election commissioners assumed office. Narendra Dahal, Ishwori Prasd Paudyal and Sudheer Kumar Shah assumed office on Thursday immediately after taking the oath of office and secrecy. CEC Yadav, according to high-level sources at the EC, has realized that with the EC board taking full shape, the situation would not be favorable for the endorsement of his controversial plan. The chief election commissioner had come in for criticism for quitely initiating negotiations for the procurement of the voting machines from the controversial company. 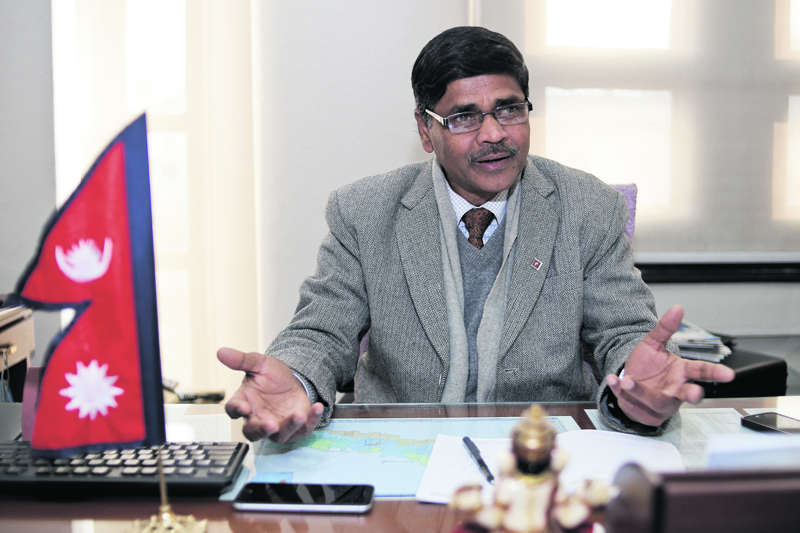 EC chief Yadav had began the negotiations without abiding by public procurement procedures and he had also kept fellow election commissioners and top officials of the election body in the dark. On February 7, Republica published a story based on multiple sources on a non-transparent deal to procure voting machines from Smartmatic. The election chief had reportedly acted with the consent of Prime Minister Pushpa Kamal Dahal. On the basis of previous contracts, Lord Mark M. Brown, chairman of the company, and his deputy Robert Dobler had arrived in Kathmandu to demonstrate the voting machines. PM Dahal himself had attended the demonstration together with senior leaders of other political parties represented in parliament. At the function, Dahal had not addressed criticism from lawmakers but stressed the need for purchasing the machines from that same company. Lawmakers and election experts were worried whether voters in Nepal where electoral literacy is relatively low would be able to use the voting machines properly. The soft ware-based EVMs produced by Smartmatic are considered relatively safe compared to other EVMs but they are highly expensive and require voter education for using them, according to the experts. 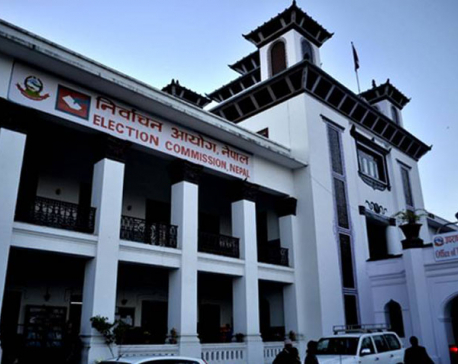 Informed sources said it costs at least $ 2,500 to procure one EVM and the election body would have to pay an additional $ 1,000 as operational cost for each machine as Nepali returning officers are not able to handle them. The EC was planning to purchase 63,000 EVMs. Senior election officials on Thursday said that preparations are underway to announce a poll date on Saturday. May 15 is said to be the date that will be announced for the first phase local election. President Bidhya Devi Bhandari, Prime Minister Pushpa Kamal Dahal and senior leaders of major political parties have been invited to the election body to mark Election Day and preparations are being made to announce the poll date at the same function. Nepal marks Election Day on Saturday, which is also Democracy Day. An informal agreement on the poll date was reached at a meeting held between PM Dahal and Chief Commissioner Yadav on Wednesday. "The poll date is likely to be announced on the occasion of Election Day," said Election Commissioner Ila Sharma. Earlier, the EC, which plans to conduct the election in two phases, had sought at least 15 days to prepare for the next-phase poll. 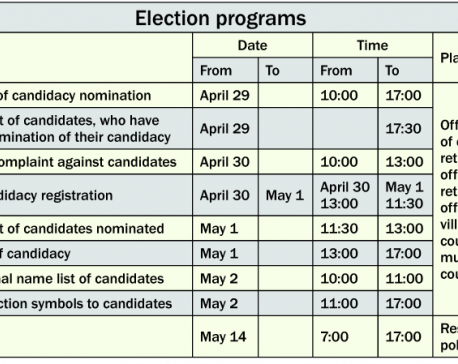 Calculating the number of days required for poll preparations, the EC had proposed May 15 as the date for the first-phase local election and June 3 for the second phase. According to Sharma, the government is preparing to endorse the proposed election date.